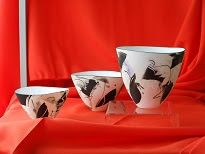 The arrival of elegant and delicate bone china bowls by John Shirley at the Artisan Gallery has generated much interest among ceramic enthusiasts. These striking black and grey abstract decorations on the purest white marks a fresh approach in the work of this master ceramicist. Other exciting and different new work is by Jabu Nala with her bold contemporary take on traditional Zulu pots.